View cart “MOZAIK Folder” has been added to your cart. Available 04/27/2019. This is a Pre-Release Sale item. This special 20% discount is only available while the MANIKOMIO is still in the manufacturing stage. PLEASE NOTE: Your card will be charged. This item is not available for immediate shipment. Manufacturing and Quality Control time could vary based on the product. You’ll be notified with a tracking number when your order is ready to ship. The projected arrival date is 04/27/2019, after which, MANIKOMIO will go through quality control measures and begin shipping 7-10 days after arrival. After 04/27/2019, the item will go to full MSRP and the Pre-Release Sale will be closed. MANIKOMIO Fixed Blade is the first fixed blade of this size that Louis Krudo has added to his line up in at least 4 years. Since the first fixed blades, RAW, MMF and HAIKU, Krudo has placed nearly all of his designing attention on folders. When he was asked to design a field knife, MANIKOMIO was conceived. You will see the strong resemblance to Krudo’s DRASTIK Folder as the design of the gladius sword inspired blade. The name MANIKOMIO refers to an insane asylum. This blade is insanely sleek and, with it’s all black elements, insanely stealth. There is a hint of red accentuating the knife handle that is the signature KRUDO Knives red. This double edge blade sports bilateral serrations with a center line groove. Krudo designed this knife with a slight radius to the scales, double-sided guard and longer than average handle length. The black, Kydex sheath is attached to a black, nylon belt system which can be easily removed and replaced with the carry system of your choice. 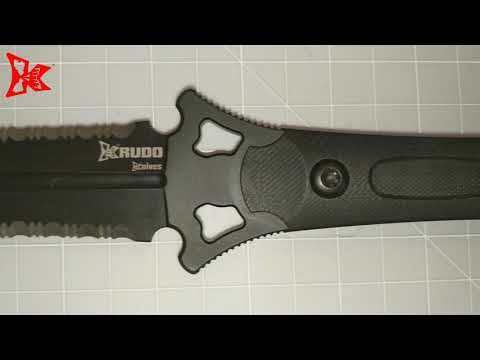 Use this knife in the field, camping, hunting and any outdoor activities where you need a serious blade. MANIKOMIO is a dependable blade, all business, yet stylish. Designed in the USA exclusively by Louis Krudo. Built per Krudo’s specifications in China.